The Cubbies Club meets every Sunday evening from 6:00 p.m. - 8:00 p.m. between September and May. AWANA Cubbies is a specially designed program for preschool children ages 3-5. Cubbies Club is a positive, fun environment where preschoolers learn basic spiritual truths from God's Word. Each weekly meeting includes carefully planned club activities your child will enjoy. 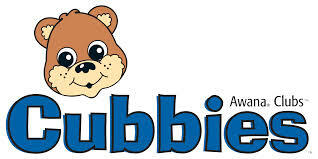 The fun begins with a visit from Cubbie Bear puppet and his animal puppet friends. We also have an exciting Bible story, singing, games, crafts, and snack time during our club time.